There are a good many ways to go about increasing fuel economy for your family car or other vehicles and a little study of the subject can repay you well over a few months. 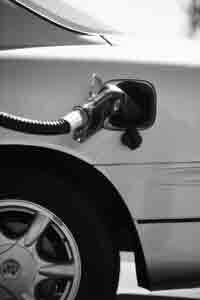 Here are my favourite ways to increase fuel economy painlessly. Some of these fuel economy tips are also very green - i.e. they will help cut down on greenhouse gas emissions and lower your carbon footprint. When moving off, change up through gears as quickly as possible so that revs are kept low. Anticipate bends and halts so that you reduce the need for sudden braking. (It's easier to get a car up to speed from a low speed than from a complete halt.) Don't use your gears as additional brakes unless for safety reasons but rather slow down earlier, letting the car's friction against the road do most of the slowing for you. See if you can work out your car's optimum cruising speed. Most cars will lose efficiency after about 55 miles per hour. If your car doesn't have a rev counter or an on-board computer that tells you how fuel-efficient your driving is - or isn't! - then you can do quite a lot just by listening. Try tokeep your car purring along quietly and you will surely save fuel. You can buy fuel consumption gauges and other gizmos but they can be quite pricey; you'll get most of the benefits by just listening to your engine revs and adjusting your driving to minimise them. This is really the same thing as keeping the revs down. Just get into the habit of not putting your foot down on the accelerator. If you think of your accelerator pedal as the gasoline (petrol) or diesel burner then you won't go far wrong. The more frequently you put your foot down, the more quickly your fuel goes down. Conversely, if you make a habit of just gently nudging the accelerator when needed to keep up your pace, then you will be doing a lot towards increasing fuel economy. Don't speed up for hills. You might need to increase revs so that you don't lose pace much but you don't need to actually speed up - well not in most modern cars at least! A little bit of planning! Plan your journeys so that you don't need to race. Try and enjoy the (slower!) journey and build in time for decent stops on a long journey. It helps to think of the journey as an event in itself rather than as something to be got over. A good stereo will help many people to this state of mind. Some people may find that a good sat nav helps them stay focused and drive more efficiently. They are supposed to help you not get lost, after all! There's plenty of anecdotal evidence that they sometimes lead you astray. But if you are travelling a lot and you frequently travel away from home, a sat nav or GPS device can be a huge help. Don't idle about! If you need to stop for anything more than just a moment or two, cut the engine if it's safe to do so. You'll save a lot of unnecessary fuel use. It's OK to let the engine warm up in winter but this doesn't take long - literally just a minute or less for modern cars. Use a bucket of water (tepid or cold) and a scraper to shift ice, rather than run the engine until the heating does the job. Air con can significantly add to your fuel consumption. Don't use it needlessly - but running around with all your windows wide open is probably worse in most cars. The drag caused increases fuel consumptionas much or more than air conditioning. Remember to park in the shade if you can. Cooling down an over-heated car body can squander fuel needlessly. Use a sun shade to help keep the interior cool if you park up in a sunny spot. Keep your car clean. Dirt increases wind resistance! It seems hard to credit it but studies have shown that it can make a significant difference over the course of a year. Same goes for snow, of course. The recent harsh winter brought snow to huge areas of more northerly countries. Even if you can't find chains to fit your tyres, it's still worth clearing the snow from the roof and bonnet. Snow is pretty heavy - unsurprising, really, as it's made of water! Have a look what's hiding in the boot or well of the car. Any additional weight is costing you money to drag it about. OK, you don't need to worry about a few maps but those five boxes of books headed for Oxfam are costing you if you don't deliver them. Roof racks are a drag! Any roof rack, even a most aerodynamic and elegant one is going to cost you in increased resistance and drag. Expect to spend around 5 mpg or more carrying your camping gear or bringing a flat pack back from Ikea. If you aren't using it, just take it off and save. Same goes for bike racks of course. Increasing fuel economy by achieving (near) mechanical perfection! Achieving mechanical perfection is perhaps unrealistic for most of us. But approaching it may be worth the hassle if you want a car that's not costing you more than it should. It is worth making sure that your car is at least well maintained and this will help in the quest for increasing fuel economy (as well as increasing safety). Here are a few of the things that will make a difference to your car's performance and thereby help in increasing fuel economy. Filters should be changed regularly and the right type of oil used in oil changes. The air filter is an important piece of kit as it prevents dirt from accessing the engine's moving parts. Some of the better quality air filters will actually save you money because the car's engine does not need to strain so hard to pull in clean air. Oil should be of the correct type. Some motor oil companies claim their products save make the gas go further by keeping the motor well lubricated. It may be worth considering using synthetic engine oil as it has some advantages over petroleum oils. You should certainly see fewer oil changes (which is better for the environment) and less sludge builds up in the engine. Synthetic oils are expensive though. Whatever oil you use, make sure that it is of the correct viscosity (thickness, usually measured as SAE) and change it often enough. Oil which is too thick is harder to move around the engine. Check that your engine is not using oil by checking the level reasonably frequently. You may get better performance from your car by having a specialist engine tune. Also check that your fan belt is not loose as this can affect performance. All this mechanical perfection can be squandered by driving about on under-inflated tyres. You can now buy special caps which display when your tyres are not up to the correct pressure. Keeping your tyres within the range set by the manufacturer helps your car to have good grip without losing energy to the ground. If your tyres are too squishy a lot of unnecessary friction is created. It's also important not to inflate tyres too much. This can lead to loss of traction - and even skidding. Over-inflating tyres does not help with increasing fuel economy in any significant way and is not worth the risk. 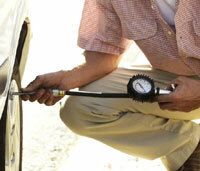 Picture, above: check your tyre pressure often - maintaining the correct pressure will help with fuel economy. Get your wheel alignment and balance checked as an uneven tread costs money and more fuel. What else? Regular services - that oil change again! Regular servicing keeps your car running at its best and also means it is less likely to break down. It's generally not worth making a special trip to collect cheaper fuel but you can save a wee bit by only filling your tank half full. If this is convenient for you and you don't have to go out of your way later to buy fuel, then this might help a little bit. Another way of increasing fuel economy is to run your car when the fuel in the tank is cold (the middle of the night?) - but I don't suppose this fact will help many people! Of course, single best thing you can do towards increasing fuel economyis to use your car less! Obvious, I know. Much of this site is dedicated to tips which help you keep from having to run out to the shops. If you have a tip you would like to share on increasing fuel economy, please see Add Your Tips! on the nav bar. Thank you!